Methinks you are my glass and not my brother. The Comedy of Errors is a perfect vehicle for Shakespearean comedy at The Globe. Running at just two and a half hours, it is the right length for sitting on wooden seats or standing in the pit. As a part of The Edges of Rome season, set in Roman Ephesus, this is a very early Shakespeare comedy inspired by those Latin plays by Plautus which featured twins and multiple misunderstandings. Plautus drew on the work of the Greek Menander who wrote over a hundred comedies. It's people in colourful togas and sandals dashing around after each other in fruitless chases. 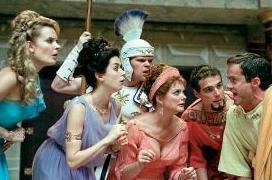 I was reminded partly of the Carry On films with their anarchic humour and of Frankie Howard's Up Pompeii which provided the inspiration for A Funny Thing Happened on the Way to the Forum. The muddle caused by two identical twins each forming the master and servant pairing is more intricate than the Roman comedies and we can see Shakespeare trying out this recurring themeof separated twins, as in Twelfth Night. (Remember that Shakespeare himself was the father of twins, Judith and Hamnet). The resulting farce is played to great effect at the Globe with plenty of rich and groanworthy puns and audience participation. The percussionist has had a field day with every punch line meriting a drum roll, every landed punch a thwack, every slap a clap on some musical instrument. The Comedy of Errors is a real crowd pleaser that's played at a rapid pace, much to the delight of the Globe's crowd of groundlings in the pit. The Antipholuses (Andrew Havill and Simon Wilson) have identical hairstyles with very silly curls on top which helps them to look alike and their servants, the Dromios (Sam Alexander and Eliot Giuralarocca) have beards and balding pates and of course identical costumes help the confusion. To the rear of the stage the onstage trompe l'oeil has been continued to create the impression of a villa beyond with pillars and corridors wittily reflecting the Globe's onstage trompe l'oeil effects. This is very silly evening and not to be taken seriously. Physical punishment is meted out to the servants whose only crime is to be mistaken for the twin each is unaware of. It is all credit to Christopher Luscombe that he can get such a thoroughly enjoyable evening out of Shakespeare's early comedy. I loved the affected and frivolous walks of Adriana (Sarah Woodward) and her sister Luciana (Laura Rees) use to exit the stage to convey flirtatiousness, annoyance or just humour. The night I was there the cast coped admirably with anticipatory heckling from the crowd which prompted an ad lib or two which was magically spontaneous.